Matching your flooring with countertops isn’t all about coordination and contrast. Everyone wants to have the perfect color scheme in their kitchen. But it can be incredibly difficult to find one that is just right, particularly if you are remodeling your home after a renovation rather than starting from fresh. It’s even harder when you already have part of your kitchen’s interior installed, like your flooring or cabinets. Choosing one to match the other is a nightmare faced by an increasing number of homeowners as remodeling is favored over moving. But a kitchen and flooring expert like the Showroom Interiors can help you find and choose the perfect material and style so you get a great looking, harmonizing kitchen. In today’s article, we will look at exactly how you can match your flooring with your countertops, whichever you are choosing to replace. If you’re remodelling your kitchen, this article is for you. Before we begin, it is worth introducing some design principles to abide by when designing your new kitchen. The first is to keep it as simple as possible. Kitchen’s look best when there are two main colors. Often this is a darker color like back or grey and a lighter color, typically white. Not only will this look match most appliances, it also means that you can add accents of color when you want to freshen up your look without having to remodel completely. If you have picked two simple primary colors, you should also consider an accent color that you want to add at the start. It may be that you already have an accent color in your current flooring or cabinets. But choose a new one if not. If you are adding both new countertops and new floors, you should always start with the countertops. There are such a huge range of different countertops and relatively few different flooring options that it makes it much easier to fit flooring to a countertop rather than countertop to flooring. All is not lost if you are keeping your original flooring, however, and we will look at what works together later. ● Natural Stone. A durable and popular choice for kitchens. It is incredibly tough and can withstand a lot of activity and it is heat resistant. There are tons of different colors and shades, including marble, granite slate, and soapstone. ● Solid surfaces. If you don’t want to shell out on expensive natural stone, you can turn to solid surfaces. They come in a variety of colors and styles, and can imitate natural stone and even glass. They are tough, heat-resistant and scratch-resistant making them an excellent choice for the kitchen. ● Plastic laminate. This is a thin sheet of plastic resin that covers plywood and can imitate stone, wood and hundreds of different styles. This makes it durable and resistant, however, be careful with sharp knives around it. ● Wood. 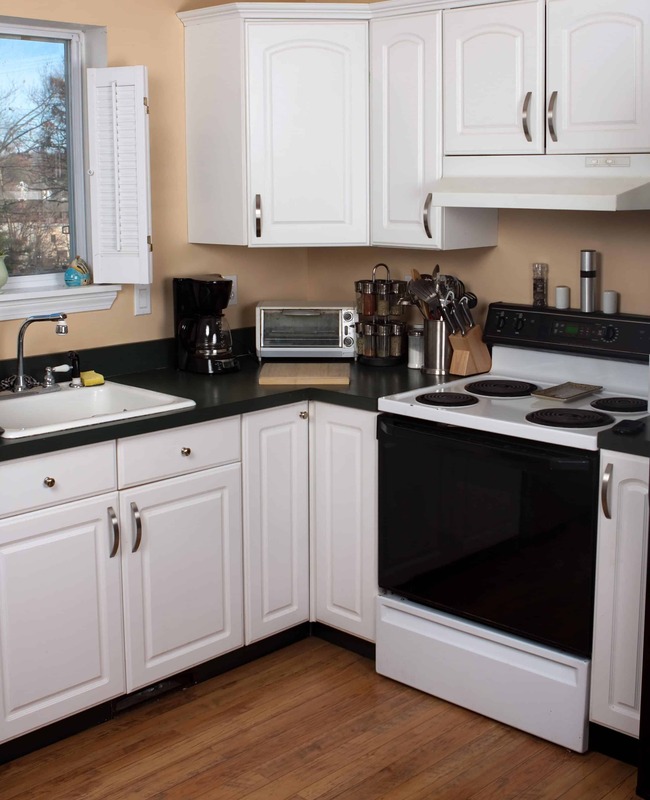 A fantastic looking, if slightly unfashionable, countertop that adds a lot of warmth to the kitchen. Careful, however, because it is vulnerable to moisture. It will need to be cared for well. Now that you have your countertops selected, the next step is to choose flooring that matches. There are two routes to take when choosing flooring. The first is to complement your flooring with your countertops. This doesn’t necessarily mean having wooden floors if you have wooden countertops. It can just mean selecting a similar or harmonizing color. The second is to contrast your flooring with your countertops and using your flooring color as the second primary color in your kitchen design. ● Wood on wood. You’ll need to have accents of other color and you definitely shouldn’t have wooden chairs, too, but there’s no reason you can’t have wooden flooring and wooden countertops. 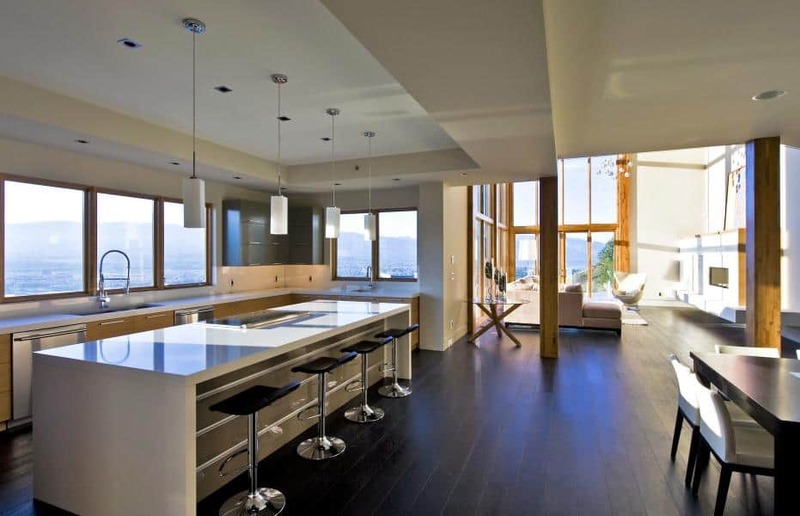 ● Wooden flooring and granite surfaces. This is a classic combination that looks great in any home. The two options contrast each other beautifully but still look and feel luxurious. ● Light tiles and marble surfaces. To make your home light, modern and stylish, try mixing light colored stone tiles with marble countertops. This is a particularly good option if you live in a hot climate as both will have a cooling effect in your kitchen. If you’re looking to make your own combination, we highly recommend bringing a sample of your kitchen countertop material with you to the showroom when choosing tiles. This will help you decide whether or not potential flooring choices actually go with your countertop color. Don’t be afraid to ask for advice, either. Experts at showrooms will have plenty of experience and will be able to advise on combinations that go. Are you looking to redesign your kitchen? 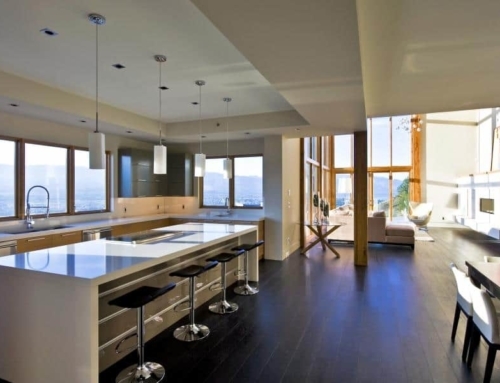 Do you need help selecting the perfect countertop or great kitchen flooring? At The Showroom Interiors, our team of advisers are well placed to help you make the right choice and to secure you the best materials at the best price. Get in touch today to find out more.